You have to admit that when you see a large expanse of healthy, lush green turf that has been striped, you start thinking of ways to achieve it in your own backyard. Striped turf looks so precise, so well-maintained and just so right that you would love to do the same to your lawn. A striped lawn is created by the light being reflected off the grass blades, because when the blades are bent backwards they look dark and when bent forwards they look lighter. You can only achieve this effect with cool season grasses that grow from seed, not warm season grasses that grow via rhizome activity. Cool season grasses include tall or fine fescue, bent grass, perennial ryegrass and bluegrass and are also known as bunch type grasses or C3 grasses. So if you have a cool season grass and would like to create an awesome striped lawn, here are the steps you need to follow. To stripe your lawn you will need a striping kit for your mower, which you can buy from a good lawnmower shop or even online. They generally cost around $100 or less and are a cylinder that attaches to the front of your mower to create professional football quality stipes on your lawn while you mow. Most stripes simply go lengthways on the lawn, but you can create whatever type of design you want. For example a curved lawn looks fabulous with a long curved stripe that follows the outline of the lawn while a rectangular lawn will look best with straight up and down stripes. You could also become quite creative and try diagonal stripes or even a checkerboard pattern for added interest and a chance to show off your expertise! So once you have attached your striping kit to the mower and if you have chosen straight up and down stripes, you will need to pick a point about 3 meters in front of you or way off in the distance if you have a large lawn. The key to a perfect striped lawn is straight lines, so even if they are curved, the lines must all match and be parallel. If you make a mistake, go over the line to make the correction or your whole design will look skewed. So try and find a straight edge to follow (garden edging or a driveway) and looking ahead, mow a straight line from one end of the lawn to the other. When you come to the end of the lawn, make sure to lift the blades as you turn the mower or else your stripes will look all wobbly at the ends and make your turns off the lawn if possible (on a path or driveway). Mow back along the side of the line that you have just mowed making sure to keep straight and parallel. If you want to create a checkerboard pattern then simply re-mow in exactly the same way, but at 90 degrees to the original stripes. Other options include mowing lines that are diagonal or at 90 degrees to your house, or even in line with your house or driveway. There are an endless supply of different options, limited only by your imagination. You could even try to recreate one of the crop circles in your backyard! 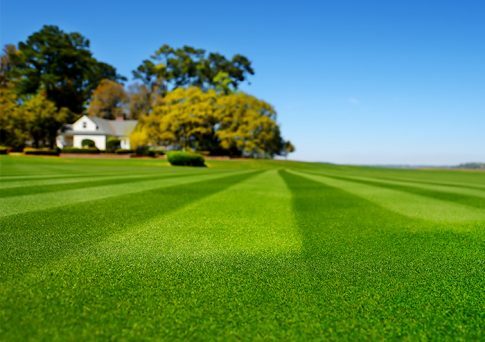 For your stripes to look their best you need to maintain your lawn with a good fertilizer and sufficient deep watering to keep it lush and green. A healthy lawn looks spectacular with stripes and will really demonstrate your expertise to all of the neighbours. Remember to not cut the grass to low however, because you will have less blade to reflect the light, so a high cut is more suitable than a low cut. For quality and affordable turf on the Sunshine Coast, call Go Turf on 1300 781 175 or complete our online enquiry form.